" This program helps train students for well-paying jobs in an industry where a shortage of trained drivers looms." 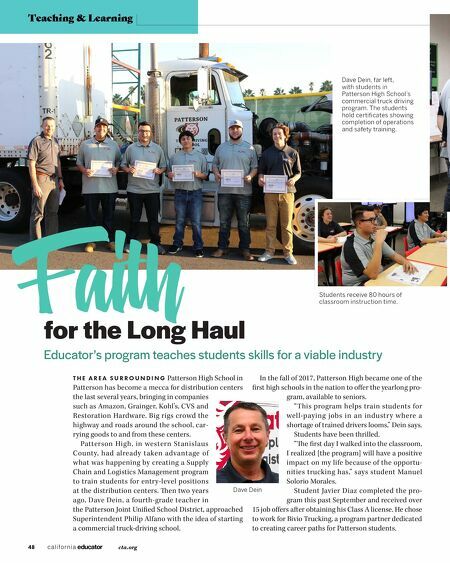 — Dave Dein, Patterson Association of Teachers A calling to teach — truck driving Although Dein, a member of Patterson Association of Teachers, has been an elementary school teacher for 17 years, he is not new to trucking. He began his career in the industry in 1988 to support himself through col- lege. After earning a degree in business administration from CSU Stanislaus, he was hired by large manufactur- ing company as a driver/manager. "I logged more than 700,000 accident- and ticket-free miles," he says. But Dein felt called to teach, so he did. Eight years later he founded a tuition-free, nonprofit truck-driving school "ministry " called Faith Logistics. For 10 years during his summers off from teaching, he would train individuals recently released from prison and provide job placement assistance. Regulatory changes affecting diesel engines forced the dissolution of the organization. For the Patterson program, Dein enlisted help from the district's Career Technical Education director, who was able to secure funding. He created an advi- sory board of industry partners such as Morning Star Trucking, Penske Logistics, Foster Farms, Northern Refrigerated Transportation and others for guidance and to assist in planning. e program is based on the highest industry stan- dards set by the Professional Truck Driver Institute as well as the Federal Motor Carrier Safety Administration entry-level driver training standards that go into effect in 2020. Students receive 180 hours of instruction time, with 80 hours devoted to classroom instruction and 100 hours for lab activities. ey get hands-on experience on a truck and two trailers donated by Faith Logistics to practice pre-trip inspections, air brake tests and cou- pling/uncoupling. In addition, students receive 20 hours of behind-the- wheel training on two Advanced Training Systems truck simulators, where they learn how to shift a 10-speed transmission that includes fuel management shifting techniques, maneuvering the truck through varied sim- ulations and backing up. "ese lessons are self-paced, with the simulator providing immediate feedback and remediation," Dein says. T h e t r u c k i n g p r o g r a m a l s o p a r t n e r s w i t h Students practice proper lifting techniques under Dein's watchful eye. 49 D E C E M B E R 2 018 / J A N U A R Y 2 019 At top, Javier Diaz gets hands-on practice; above, Leilani Barradas uses a truck simulator to navigate the road.